"Although it’s a winter sport...you can actually train for it predominately on a track and in a weight room"
Meet Seun Adigun, a member of the history-making Nigerian women's bobsled team. 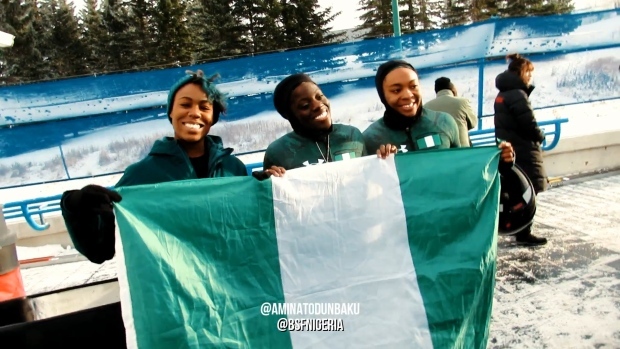 The women are not only the first bobsled team from Africa to qualify for the winter Olympics, but also the first Nigerian athletes to ever compete in the winter games. Three women are set to make history as the first bobsled team to represent Africa in the Olympic Games. The team is made up of Seun Adigun, Akuoma Omeoga and Ngozi Onwumere of Nigeria. They are headed to Pyeongchang for the upcoming Olympic Games, marking the first time the continent of Africa has been represented in the sport. It is also the first time that Nigeria will have a team in the Winter Olympics. “Because Nigeria was looking for their first ever Winter Olympians and Africa had never been represented in the sport, I thought to myself, ‘You know what this has grown to be much larger than me and it’s time to do something about it,’” Adigun explained, speaking from her New York hotel room last week. The American-born team formed in 2015, completing the majority of their training in Houston, Texas. "Hopefully generations to come are going to branch into the winter sports and maybe we'll have a skier," brakewoman Akuoma Omeogo said. "It's not just about bobsled. it's not just about Nigeria. It's about all of Africa as well. So we hope that's just going to be a domino effect." The story has echoes of the blockbuster 1993 film "Cool Runnings," which followed the story of four Jamaican bobsledders who take a team to the Winter Olympics for the first time. The comedy was loosely based on the true story of the Jamaica national team's debut in competition during the 1988 Winter Olympics in Calgary. The women have gained prominence in the U.S. since qualifying for the Winter Games in November, winning sponsorships from Visa and Under Armour and even making an appearance on "The Ellen DeGeneres Show," which Onwumere says she will brag about when she's in her rocker in old age. In bobsled, speed and strength help athletes in their race against the clock, Adigun said. In Olympic competition, bobsledders complete the course twice, with the average of their two times serving as their final competitive total. “Interesting enough for the sport, although it’s a winter sport and it’s operated on ice, you can actually train for it predominately on a track and in a weight room because the most important skills that are associated with being a bobsled athlete are being strong and being fast,” Adigun said. The Nigerian bobsled team is traveling to Pyeongchang with hopes of bringing home a medal, but they’re certain that the competition will be fierce. 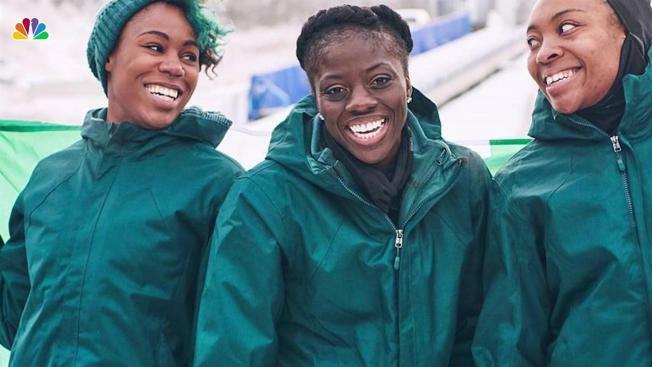 The Nigerian women’s bobsled team started with a hand-made wood sled in Houston but managed to raise money, attract sponsors and qualify for the 2018 Winter Olympics in Pyeongchang. “So as a natural competitor, I’m not going to the Olympic Games without trying to fight for a podium spot, but as a realistic individual who respects the sport I know that it takes a lot of work and dedication and I don’t want anyone to take away from the athletes who have put in all that work,” Adigun said. NBC's Katie Warren contributed to this report.